I guess that two months isn’t really such a long time to be away from home. It’s just that I haven’t done an extended trip like that in a long time. I am reminded of the times when I lived at the southernmost tip of continental Chile and used to go up to Peru and Bolivia for the winters. I would spend months away wandering about, only going home when I had become too skinny and undernourished (I always traveled on a typical backpacker’s budget!). It is always bewildering after you have seen so much, experienced so many different things, met so many cool people and learned so much to go home and find that everything is the same! How could this be when you feel so different?! However, returning home this time was a little different because things had changed. Stuff happened, people disappeared, things accumulated….one of them being DUST…two months of the wretched stuff! But now I am back into the old routine. Yes, here I am blogging away on Thursday in socks and sweaters. Fifty-five degrees…that’s COLD for Santa Cruz. The palm trees look rather forlorn against the grey sky. 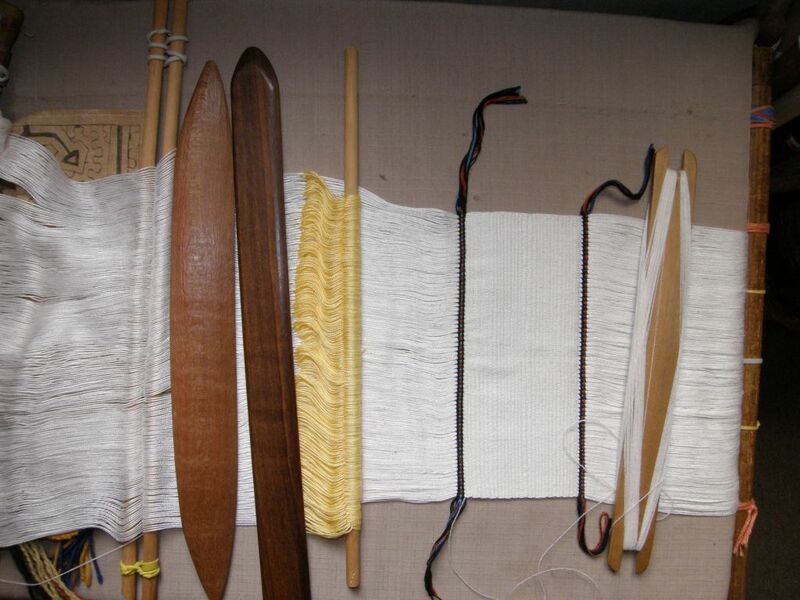 Time for some weaving therapy! I made up the bag for the wee Casio camera. This project accompanied me on the road and was hitched to numerous places along the way. I finished the weaving while I was up in Massachusetts. 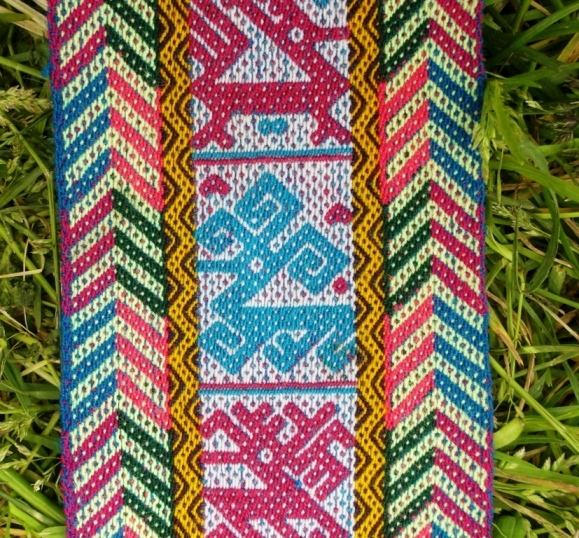 The pattern is one from Bhutanese textiles. Now, how to sew it up? The first idea was the one on the left…a bag with a flap which I would cut and shape and edge with a tubular band. However, the motifs were not ideally placed for that and so I ended up with the style on the right. I squared off the bottom of the bag and added a single large snap closure on the inside. It is edged with a sixteen-end black plain-weave tubular band. I continued weaving the tubular band after covering the edge so that I could also use it as a strap and then added a four-strand braid to that for extra length. The transition from tubular band to four-strand braid is covered by a tassel…a trick I learned from my sling braiding teacher in Peru. I think these tubular bands are very cool and so handy. I have been playing with some other plain-weave ones in different materials. The one on my bag is in #10 crochet cotton and here are a couple of others that I made in wool. The yellow and blue one is woven with a DK weight wool I love the way the simple stripes spiral. The other one is in a lighter weight wool and you can see that even a lightly twisted yarn works. As the warps are so narrow, the problems of stickiness that usually occur when using wool in warp-faced projects are not a big deal. The warps did not break but my weft did once from pulling it very tightly but that was not a problem. Another cool thing about tubular bands is that it does not matter what the lower face of the band looks like. That gets hidden within the tube. 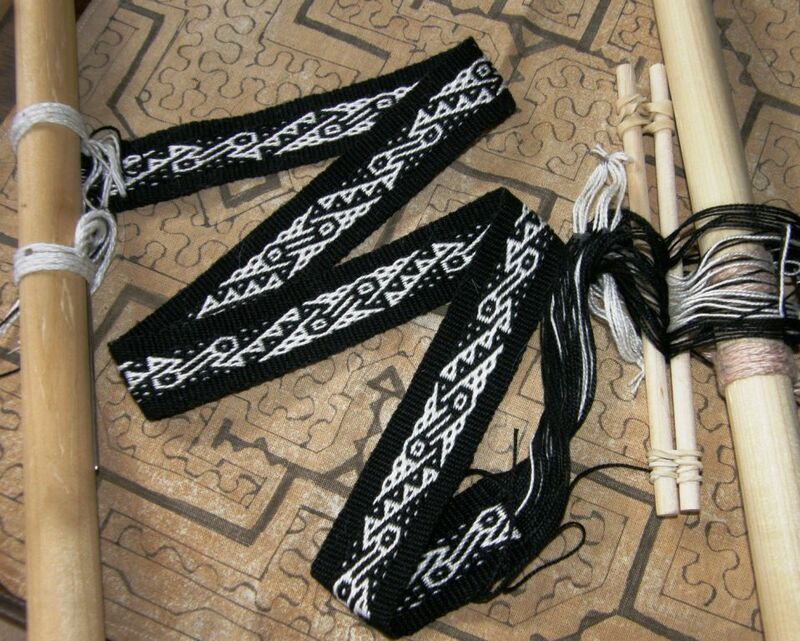 I wove a ñawi awapa band (see some ñawi awapa bands pictured on the left) as an experiment as a flat rather than tubular band and saw the chunky chaos of crossed and twisted floats that is created on the back side of the band from all the strange warp crossings and manipulations. But that does that matter? No! All that gets hidden within the tube. Now what other technique do I know that has a pretty “right” side and a messy “wrong” side of awkwardly long floats?…the warp subsitution technique, of course! Actually, any warp-faced band whether it be plain or patterned with any kind of pick-up can be made into a tubular band but, since the warp substitution technique is often overlooked because of the long floats that are created on the reverse of the fabric, why not use it for tubular bands where none of that matters? So, the other band pictured above has three-color horizontal bars which I was able to create with the warp substitution technique. All the cumbersome long floats are hidden within the tube. 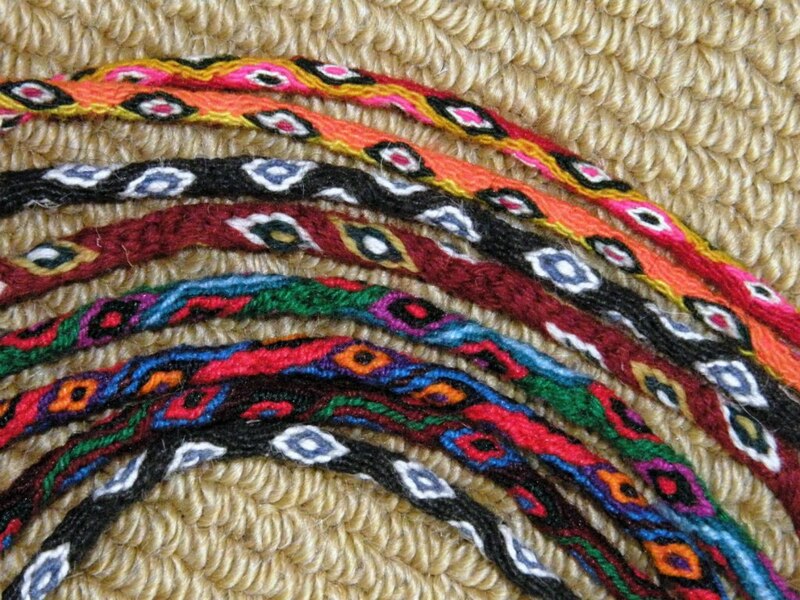 These bands are fast and fun to weave, quick to warp and can be stretched between a toe and finger to weave. If that doesn’t suit you, you can attach one end to your waist with a cord through the end loops. If you don’t fancy using your big toe, as the weaver from Tarabuco pictured at left is doing, a cord can be passed through the end loops at the other end of the warp which can then be wedged inside a drawer or looped over a “C” clamp. I am going to use these tubular bands as pretty ties for my loom and any other time I need cord for my weaving projects and I hope to experiment a lot more with designs and colors. There is something very lovely and somehow “earthy” about creating this plain and simple warp-faced white cloth and I want to make any patterning minimal. 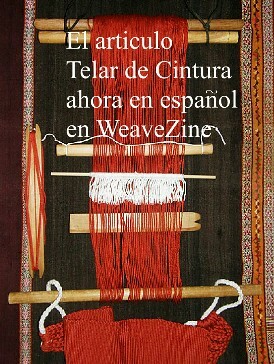 I have added a couple of weft-twined sections. Perhaps I will do some more weft-twining or maybe some soumak with a bit of added patterning with supplementary wefts. I left a lot of unwoven warp at the start in case I want to add a large weft-twined pattern later. As usual I don’t have plans for the finished piece. I will just see what happens. Then there was time to do something with a sample piece that I had completed shortly before leaving. You may remember the ikat weave-along that we were having on Ravelry. My friend Betty in the US gave me a huge roll of ikat wrapping tape so there will be many more ikat experiments in my future! I have been using cassette tape until now and had a small “oopsy” in my last project when my dye solution was too hot for the tape. I am sure that this special tape has been designed to stand up to being boiled in dye baths. It is very wide but tears easily into perfectly straight narrower strips…what a dream! Here is the second warp which I tried after the green one above. This was my first time trying over-dyeing with a second color and spot dyeing. My friend Jeen in the US gave me a lovely travel journal and, even though its cover is very beautiful, I decided that my experimental ikat piece would make a wonderful jacket for this book. I have to admit I was a little nervous. Was I about to ruin both sample and journal? I used contact cement which is pretty strong stuff. Would it eat into the material on the journal’s cover and destroy it? Would I mess up and glue it on crookedly? I have done that before with contact cement when gluing cork sheets to a table top. Once that stuff is ready to go you are pretty much committed and it won’t forgive any mistakes! Fortunately it all came together and I am very happy with the result. The little vessel in the picture was a gift from a friend in Ecuador. The pen is made from sandalwood and was brought to me from India over forty years ago! Goodness knows how I have managed to hang onto it after all these years of moving around and having to abandon possessions along the way. The mug rug on the far right is part of a set inspired by African designs that I made on my backstrap loom in double weave. And here it is on my backstrap loom. I love the way the bird motif changes from black to white along the length of the band. And now I have a new strap to study which was lent to me by Susan who visited me when I was traveling. She brought it along and I was delighted to be able to see both sides of it. There are so many pictures online of these bands from Oaxaca, Mexico but you never get to see the back side. 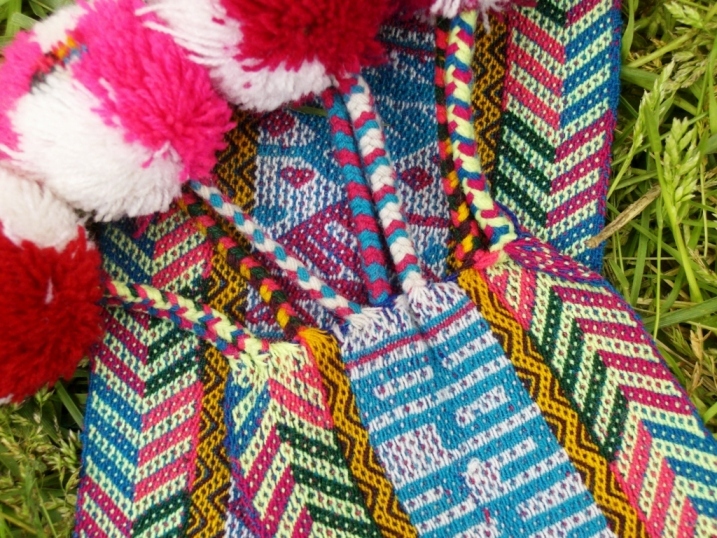 There are many more examples of these on Teyacapan’s Flickr page of Mexican textiles. Perhaps this structure is woven somewhere here in South America too but I have never come across it so this is a great opportunity to take a good look. 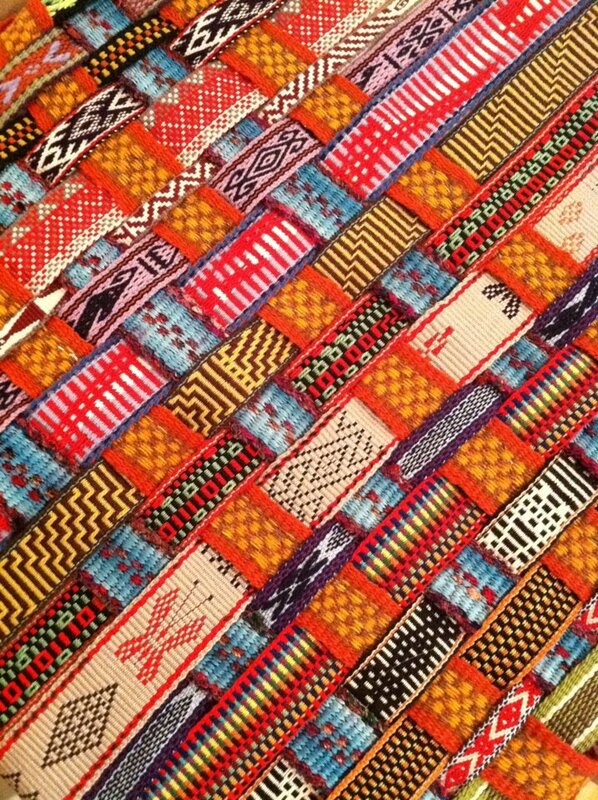 Maybe it was woven here in pre-Columbian times. She urged me to take it home and just send it back to her when I am done. How cool is that? I have this urge to go back to some simpler things and explore them more…like the white plain-weave piece I am doing, some more very simple ikat motifs which again involves just plain weave and I have been also looking again at simple warp floats. 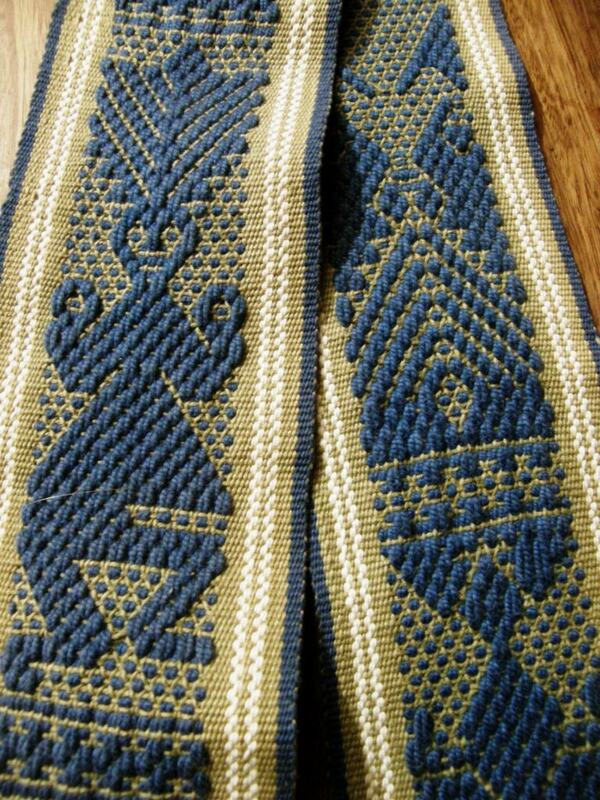 One of my weaving friends in the US wove this cool backstrap after having woven simple warp floats with me. We just played a little with floating both colors and she went on and ran with it. At left you can see various parts of Kristi’s backstrap which is patterned with floats in two colors. She used it the second time we wove together. 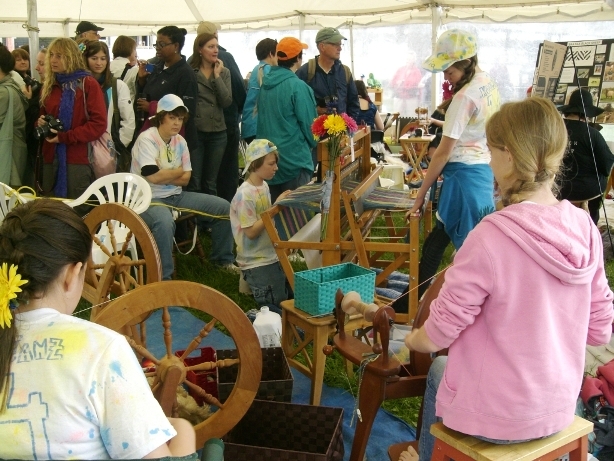 When I was at Maryland Sheep and Wool I got to see many people of all ages being introduced to fiber activities. Elisabeth Hill, who I have known some time online and whose fabulous work on deflected double weave I always follow on her Flickr page (she’ll be teaching it at Convergence), came to Sheep and Wool with her niece Kylie. Kylie got a class in inkle weaving from Sally Orgren on her famous and well-traveled loom when we had a Weavolution meet-up at midday. Look at that smile. It looks like a new weaver has been born. One of Elisabeth’s deflected double weave pieces won first prize in the exhibit at Sheep and Wool. I don’t think the picture I took does it justice so please take a look at her Flickr page to see all her beautiful creations. There’s my friend Claudia chatting with spinning teacher Maggie Casey before class and Richard Ashford was at The Mannings booth giving spinning tips with Tom Knisely looking on. And the guys were into it too. Here is a gentleman having a spinning class on the ”Pocket Wheel” which was a big hit. It was fun to see the team of young guys and gals who entered the Sheep to Shawl Competition this year. Isn’t that spectacular! Now you can see where my little purple and yellow band fits in! 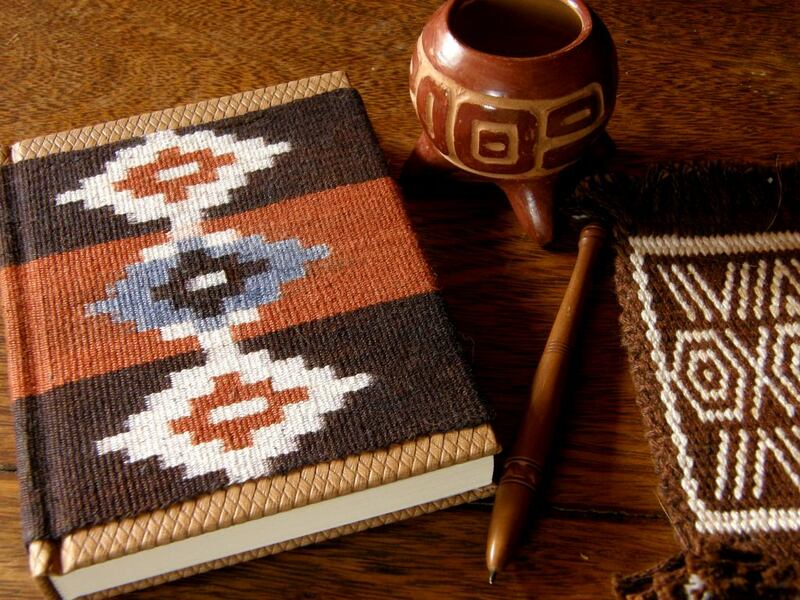 This was woven in Ayacucho, Peru and is probably from the same area or at least very close to the place from which my pebble weave teachers originated. Although they taught me in Huancayo, they are natives of Ayacucho and the little animal motifs on this band are very much like the ones they taught me. I would guess that this band was woven with the same two-heddle method that I learned in Huancayo with some additions for the third color. The quality of the weaving is superb. Sadly it probably won’t be “popular” with some tourists who generally seem to prefer handspun wool and natural dyes. There is so much weaving in Peru that we just don’t get to see and coming across these bands at the Sheep and Wool festival was such a treat for me especially since I have not seen anything like the motifs I was taught back in 1996 in the books I have on Peruvian weaving. 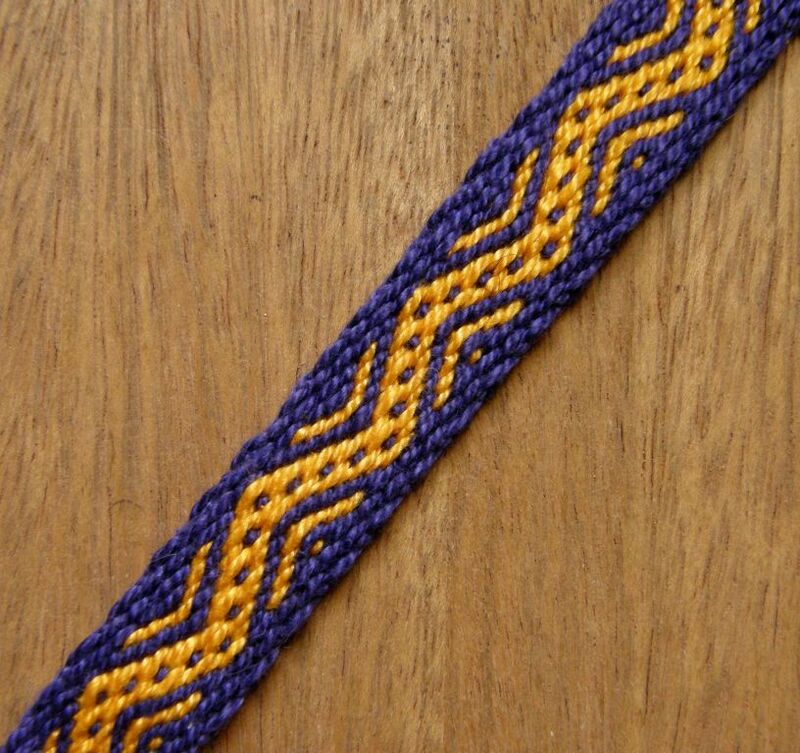 Except for the purple and yellow section, it is a three-color pebble weave. Aren’t those braids and pom poms beautiful?! Here is a little something I picked up from the same stand. 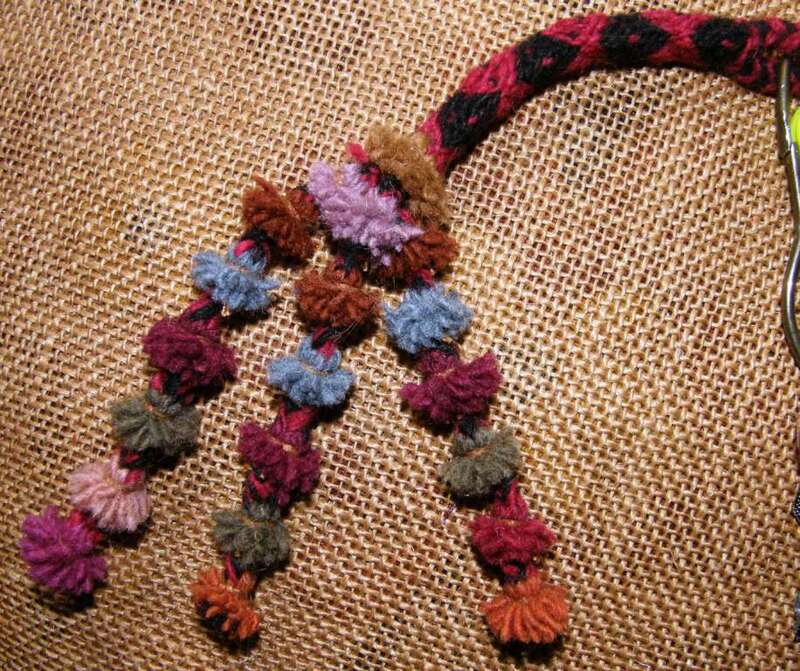 I was tipped off by braider Rodrick Owen that these were available there….a sweet braid with tassels from Ayacucho being sold as a keyfob. And finally, here is a wonderful display of bands made by Yonat. Yonat feels more comfortable on an inkle loom and so takes what she weaves with me and transfers it to her loom. Not everything here was originally backstrap weaving. 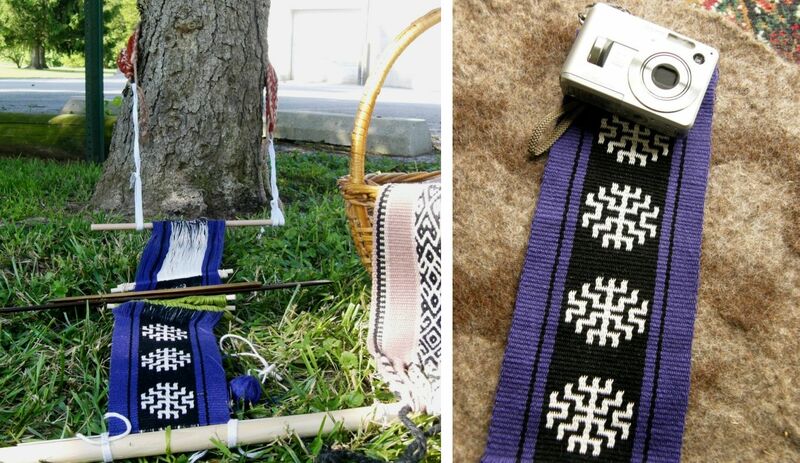 Some bands, for example, are from the workshop on Sami weaving by Susan Foulkes and others are Yonat’s original creations. See you next time. I hope that all of you can take some time off for a little weaving therapy this week. 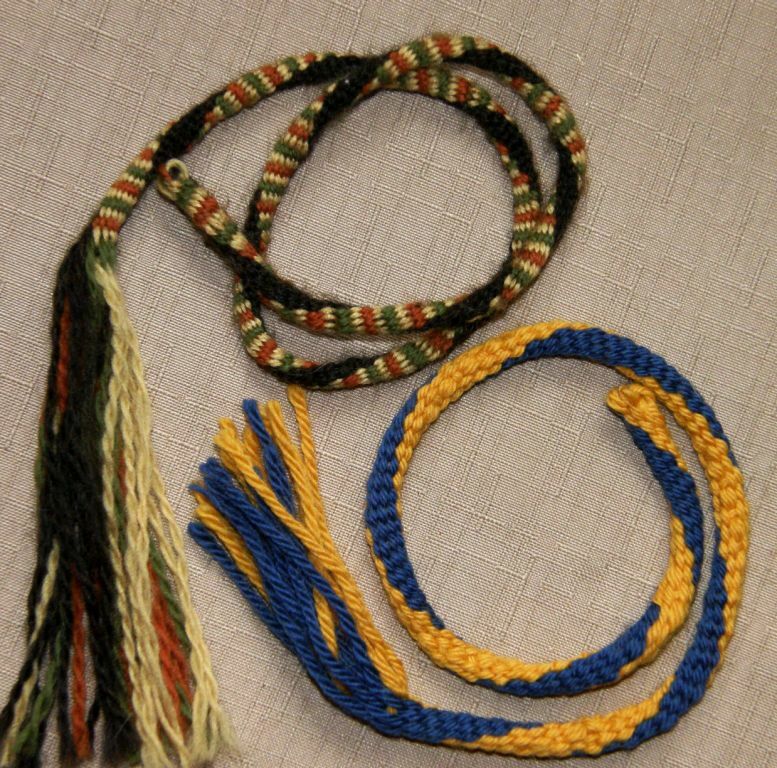 « Backstrap Weaving – New Looms, New People, New England! Love all the bands, including the tubular ones! The tubular bands are fun, Jennifer and you will instantly find uses for them even if just to tie up your warp when it is rolled up. Hope to see some from you soon. Laverne, your photos are always so gorgeous! What a dazzling collection of beautiful weaving! 😀 Thank you! Thanks Noreen. I am so glad to have my “old” camera back with which I feel so much more comfortable and competent. Your ikat piece makes a great book cover. And I love that pattern on your camera bag!! Lucky camera! 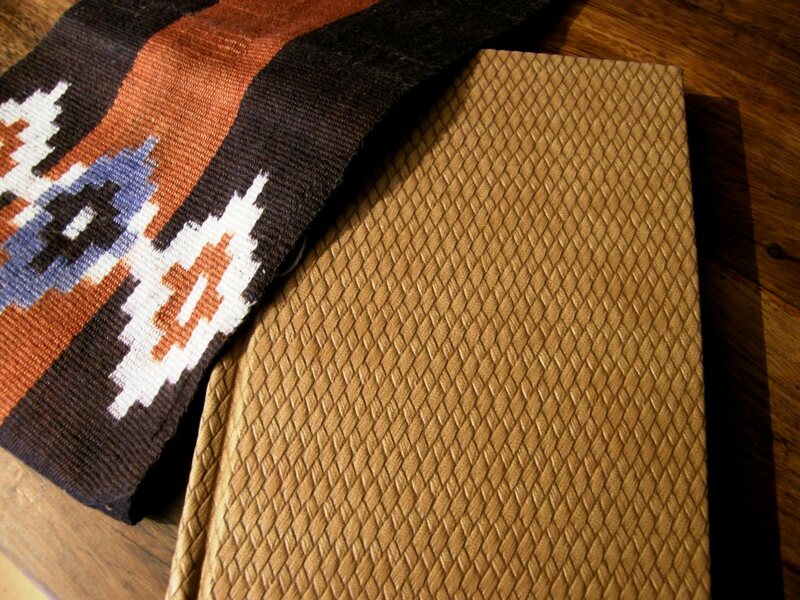 I’m happy to see that you posted Yonat’s weaving photo here for all to see. What a cool visual that makes with woven weavings. I’m glad to have such talented friends! Imagine all YOUR bands set up like that Annie. You could probably carpet your living room! Oh, good idea! 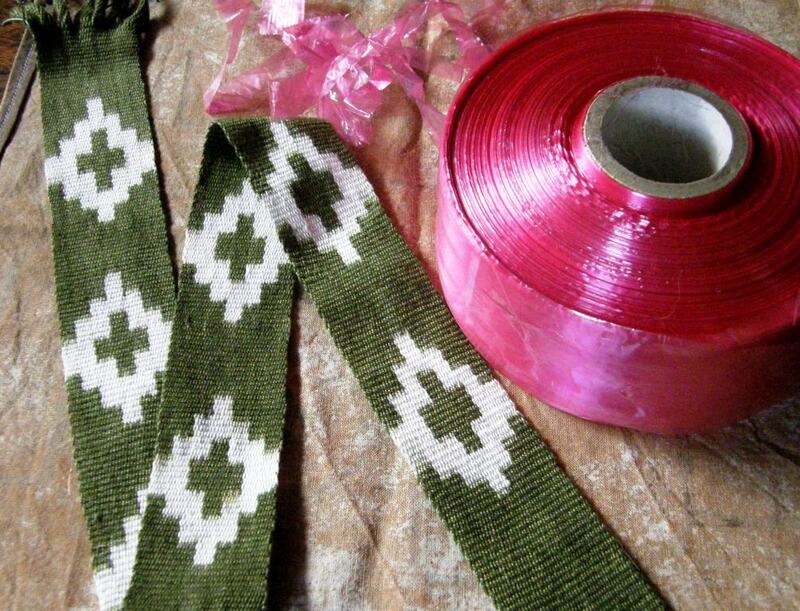 Right now they are in a big heap on the living room floor, all I’d have to do is lay them out and interlace them! Ha, Ha! I was lucky enough to take spinning classes from Maggie Casey at her shop in Boulder, CO. I love how calm and laid back she is. So much fun to see her pictured here. I’m off to CO next week. Hopefully I will take a couple more classes at her shop this year. I know I and others have said this before, but it bears repeating just how much we appreciate sharing your travels with you, as well as your weaving. Love to look at your photos and read about your adventures. You met with Jeen whom I only know from her wonderfully helpful online presence at Ravelry. I wanted to be a bug on the wall that day–have to say I did not think the journal cover could be improved, but your treatment of it turned out to be absolutely perfect! It retained it’s look but was combined with your innate self represented in the weaving. It made the book uniquely yours! Thank you so much Eliza. Lucky you getting to spin with Maggie Casey. Have a wonderful time in CO.
Could it be pebble weave with the dark/pattern ends doubled? Thank you Jen. That is a great link! The words “pebble weave” are used to describe many kind of structures that have a “spotty” effect and can be very confusing. This is not the same as the Andean pebble weave that I describe in my book with its regularly alternating pebble sheds. I use the definition of pebble weave as described by Cahlander and Cason in their writings on weave structures of the Peruvian and Bolivian highlands which refers to a complementary-warp structure. The structure of the Mexican band is not complementary-warp. The exposed weft and spread thin warps make it very hard to see what exactly is going on with this Mexican band so I will weave it and see what happens. 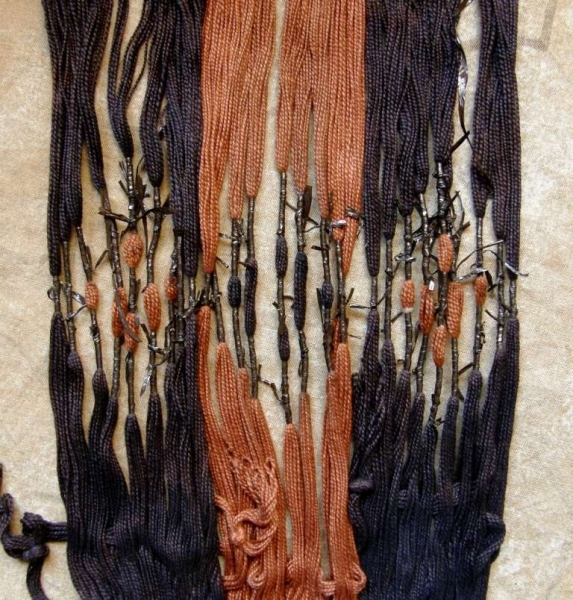 Edited to add: Marijke Van Epen has written about this structure too as does Anne Dixon in her new book on inkle bands. I love all your bands,Laverne. Beautiful weaving! The colours are what we need on a rainy day! Thanks Jeanne. What’s with all this dismal weather everywhere? Hoping for a sunny weekend for everyone. Hi Laverne. This gray, chilly day has been brightened by your latest post — don’t I just love a morning spent with your great stories, inspirational photos and the outstanding work you do. Oh, and a hot coffee of course! As usual, so inspirational. Thank you for sharing! H Laverne, I have belatedly checked in to see what wonderful adventures in weaving you have had since you returned home. As usual, your posts are beautiful, fascinating and informative. The special bonus for me this time was to see Kylie’s smiling face working away at Sally’s inkle. I think you are right in thinking that she will remember that experience later in her life. Even if she never inkles again, just the experience of making cloth with her own hands will inform her experience of the world. Thanks for posting. P.S. Chris and Kim brought their tubular bands to our weaving group – the ooohs and ahhhs flowed! Thanks Lisa. I hope Kylie got to see the pictures too.